Well-planned low carb diet for vegetarians is a nutritionally healthy option and equivalent to a diet that includes meat and/or fish. But if they are performed incorrectly they can cause health problems. The basis of food in many parts of the world is composed of carbohydrates. This group of foods is one of the most important, because it provides the immediate energy that the body requires to function properly. However, the health of many people is altered by the type of flours they choose. In recent years, several studies have shown that decreasing the consumption of carbohydrates in the diet favors weight loss, because when consumed in excess they become addictive and their excess increases body fat. For most people it might be easy to replace flours with protein and healthy fats, but what is the best low carb diet for vegetarians? Any person, with the exception of any specific pathology, who wants to lose weight can follow a diet low in carbohydrates. The key is not to eliminate them completely, but to change them for healthier options. Rice, pasta, whole grains, corn tortillas and legumes are a source of fiber and can bring important benefits to health. The vegetables are a large, delicious and varied group, source of vitamins and minerals. They provide very little amount of calories, so they should be used and should have prominence on the plate, in the main meal times. Fruits provide carbohydrates, however, you can choose those that have less amount of sugar and more fiber such as apple, pear, cherries and all those fruits that have peel. It is advisable to consume them whole to take advantage of the fiber. Fats of vegetable origin are part of a healthy diet. Nuts such as nuts, almonds, peanuts, are foods that can be used in snacks. Avocado and vegetable oils can be used in salads, the latter provide omega 3 and are cardiovascular protectors. With respect to vegans, there are different types, strict vegans that do not consume any type of food of animal origin and ovo-lacto vegetarians who consume products such as milk and eggs. The egg contains small amounts of carbohydrates. In addition, recent studies indicate that eating eggs at breakfast helps weight loss as they provide greater satiety. With respect to dairy products, low fat options should be chosen. Yogurt is a source of protein, especially Greek yogurt because it provides twice as much protein as a normal one. Cheese is considered a protein because of its low carbohydrate content, it is an excellent option to give more variety to the preparations. All these foods provide a good source of vitamin B12, which should be supplemented in the case of strict vegans. A good recommendation for vegetarians is the use of soy, foods such as tofu and tempeh are rich in protein and fat, it is a good option to include in a low carb diet. Does this diet model work for everyone? Obviously, this example of diet is very general and has to be adapted to each person. 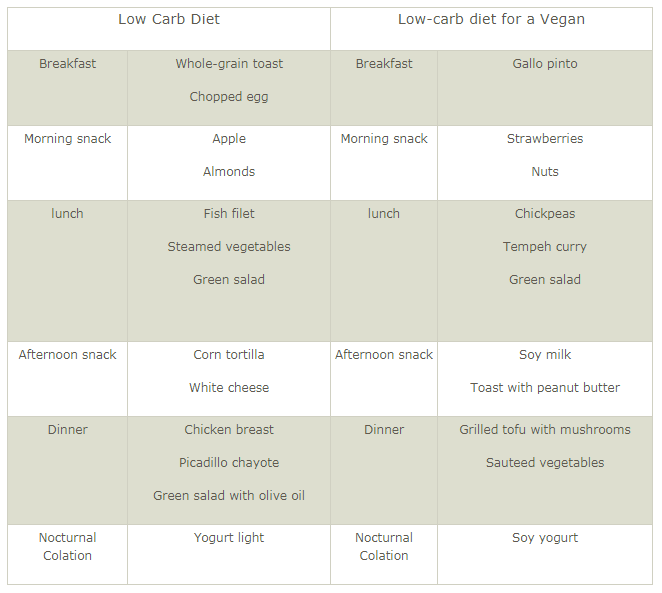 I just wanted to show what an example of this type of diet would be like in the vegan version, but if you are thinking of doing it, I have to tell you that you have not assured success, since you will have to adjust the kcal and macronutrients to your needs. It is also not useful for everyone to make a “Low Carb” diet. Among some of the disadvantages it has is the reduction of physical performance and testosterone; so it is not highly recommended for athletes with very demanding training, and if it is done, it would be convenient to do one or two days a week very high in carbohydrates to replenish glycogen reserves, in addition to an intelligent use of sports supplements. Note: Before starting a “Low Carb” diet, consult a professional to advise you. Should it be followed every day? It depends on each person, the intensity of the training and many other factors. What is clear is that if you follow a diet low in carbohydrates for a prolonged period, it will be convenient to do load days (REFEED’s) periodically. In these days we will increase the carbohydrate intake in an exaggerated way, we will keep the proteins at the same% and we will lower the fat a lot. With this we will avoid that the metabolism slows down, something very habitual in prolonged hypocaloric diets; And in the meantime we will give a taste to the palate, since foods rich in carbohydrates are very introduced in our culinary culture. I hope you liked the article and, if you were of those people who think you cannot take a “Low Carb” diet, increase muscle mass or be a high performance athlete with a vegan lifestyle, it’s time to change of opinion.